If there's a gas leak in your Los Angeles home, you may start to notice the distinct smell of a sulfuric odor similar to rotten eggs. 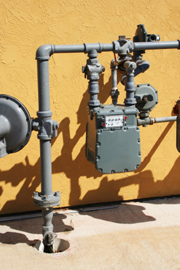 If you have natural gas lines in Los Angeles and you start to smell a noticeable odor, you should contact the experts at TV Plumbing for a gas line evaluation and leak repair right away. As natural gas does not have a detectable scent, a sulfur-based odor is actually added to the gas so that homeowners can detect a gas leak before serious damage or injury can occur. At TV Plumbing, our certified plumbers use high-quality, state-of-the-art electronic leak detection equipment, which allows us to pinpoint the area where the concentration of gas is the highest. Gas leaks are extremely dangerous and should only be handled by experienced professionals. When it comes to gas line repair and maintenance in Los Angeles, we have all the tools and experience necessary to locate and repair the gas leak quickly and effectively so that you can get back to enjoying a healthy home. If you believe you have a gas leak in your Los Angeles home, be sure to leave the house and call us quick. We can detect and find any gas leaks in or on the outside of your home. If any are found, we'll make repairs for you after we discuss what's needed with you. Many homes here in Los Angeles have gas furnaces, water heaters, and appliances. If the equipment is leaking, we can repair or replace it for you as needed. Natural gas service is provided locally through an underground system. These systems are aging and require an update to your system. Occasionally these systems fail, indicated by a leak. Leaks after the gas co meter is the property owners responsibility to repair. We at TV Plumbing will assess your system to determine if it can be saved or better to replace the system. This is determined by several options. Can we in fact find the leak if it is locatable. Some systems the pipe is not accessible. In this case we may be able to isolate a section of pipeline and perform a bypass of the bad sections. We own numerous instruments to help determine a leaking location. The system carries such a low pressure (less than 5 lbs). The pipe work systems are normally installed at one time and in one direction. This means opening up a system in the middle of a system can easily create problems up or downstream of the leaking sections. We normally find interior systems failing after a lifespan of 40-50 years. A system this old is a high candidate for an upgrade. NO reason to risk a gas line explosion. We generally have found that underground systems are best in polyethylene pipe. Plastics are somewhat flexible and allow for ground movement as well as expansion etc. Interior work, above ground, approved materials are black and galvanized rigid pipe, a flexible stainless steel tube is also approved by the UPC. All gas work needs to be tested and confirmed there are no leaks. The absolute best solution if you smell gas is to simply call on PGE utility. They can send someone qualified to test your system and confirm it is not leaking.